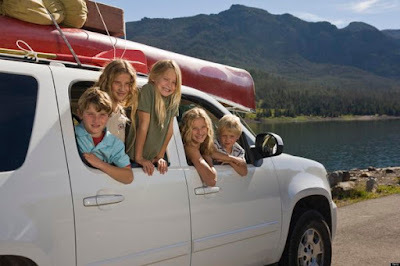 A station wagon, the family dog, four kids and 2000 miles of endless highway. The 70’s and 80’s were our best road trips days. We had crayons, books, an imagination and a pillow. I am certain the pillow was there solely in hopes we would sleep for 1,995 of those said miles. Truth be told, these truly are some of my fondest memories. Masking tape right down the middle of the back seat (my sister better not cross onto my side), a few arguments along the way, but countless laughs, adventures and memories. Fast forward 30 something years, and here we are again, with a few more modern conveniences. We have done Vancouver to Disney several times, and now some shorter trips with our 5 year old. Here are our road trip strategies for keeping your toddlers to teens, happy in the back seat. And not to mention, keeping your sanity in tact until the next rest stop. PS, I did consult my little travel sidekick, and I was on par with all of my “must haves” for the car. Whew! Kid approved! No matter the age, all kids seem to love to doodle. I make up games, who can draw this or that. A Ziploc bag with some crayons, stickers and paper, and you are set. We also pick up the play pack from Dollarama for $1.25 – a fun little pack for the kids to pick through. Literally a Mom hack. My friend Lindsay introduced me to this. We use an 11x14 size Tupperware container, which is perfect for containing snacks, crayons, crumbs and everything in between. They act as a perfect tray for the kid’s laps, and keep all food and drink in tact. The best idea ever! Yes, no matter the age, we seem to be stuck in the digital world. And with that, most cars come with usb outlets in the vehicles, which are perfect for charging iPods, phones, and other electronic devices. Do not forget the headphones! While this may seem very obvious, I always seem to forte one or the other. I pack it the night before, and leave it in the car seat. Never to be forgotten again! Keep them comfy. Even the teens love their pillows. I use the large Ziploc bags. I write their name on the bags, pack it with snacks, ONE treat, a few healthy options, and a bottle of water. We avoid pop and juice in the car for obvious reasons. And if a spill occurs, far less of a mess to deal with. The kid’s love going through their bags and picking out whatever they want to eat. And it’s right there in their snack tray, ready to go. The Ziploc bag also becomes their garbage bag. Get out at those rest stops, run around, stretch your legs. Too long in the car often results in cranky parents and cranky kids! Take the extra 20 minutes to stop and burn off some energy. Keep a soccer ball handy, or a Frisbee to take 10 minutes to get those little legs moving. They easily settle back in the car after a burst of energy. Enjoy your trip. And remember, it is often the journey, not always the destination. Make the most of it, and create those long lasting memories along your way.